A reinforcing shot of cold air is impacting much of the country -- with nearly two-thirds of the eastern U.S. seeing bitterly cold temperatures. Temperatures in some parts of the country are 20 to 30 degrees below average with life-threatening wind chills in the Northern Plains. 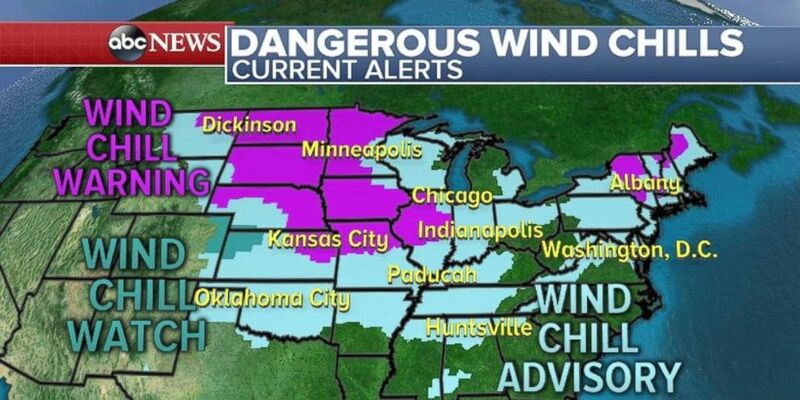 Wind chill warnings, wind chill watches and wind chill advisories have been issued for nearly two-thirds of the nation. (ABC News) There are alerts across much of the country on Dec. 31, 2017 due to very cold air and wind chill temperatures. Wind chills on Sunday morning are minus 20 and minus 30 across the Northern Plains with locally lower wind chills. In the Northeast, wind chills are in the single digits, and below zero in New England. The bitter cold is now reaching all the way into the southern U.S. with single-digit wind chills from Oklahoma to Tennessee. Wind chills are life-threatening in the Northern Plains Sunday morning with wind chill values locally less than minus 50. This region of the country will not see temperatures above zero degrees until Tuesday at the earliest. (ABC News) Wind chills are extremely dangerous at minus 30 and worse in the Northern Plains. Some locations within the U.S. are on track to have the coldest New Year’s Eve in nearly 50 years. In New York, it will feel like the single digits nearly the entire day on New Year’s Eve and at midnight the temperature is forecast to be 11 degrees in Times Square. The wind chill will be near minus 4. 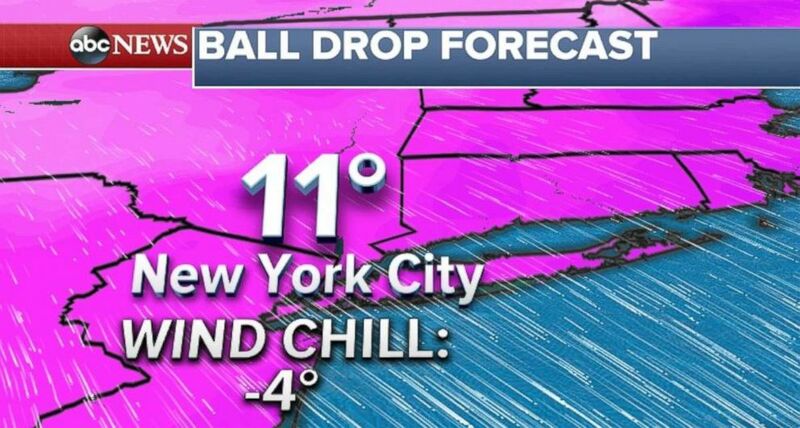 Should the temperature be 11 degrees at the time of the ball drop, it will tie for second-coldest all-time -- set in 1962. (ABC News) The temperature could tie for the second-lowest all-time in Times Square on New Year's Eve. 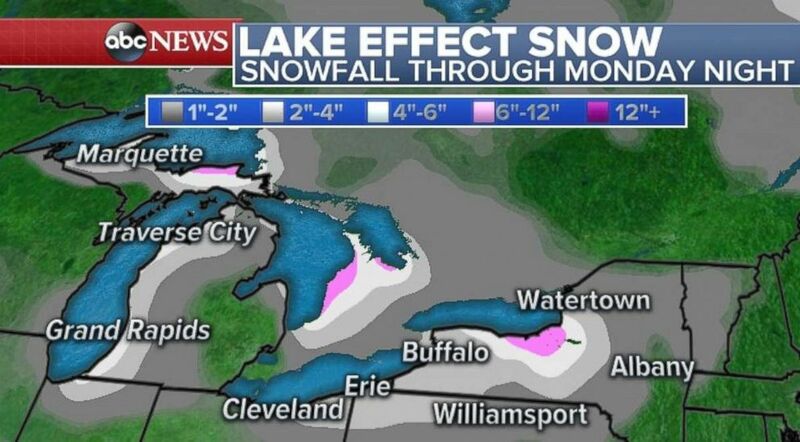 After receiving heavy snow on Saturday -- including nearly another half a foot in Erie, Pennsylvania -- lake effect snow will be become relatively less intense for much of the Great Lakes region. However, several more inches of snow will fall through Tuesday for much of the region. Slick conditions from light snow on Saturday also played a role in accidents in the Philadelphia region. More than 15 cars were involved in a crash in Montgomery County, Pennsylvania, on Saturday with injuries reported. (ABC News) Lake effect snow will be lighter on Sunday and Monday in western Pennsylvania and New York than it was last week. In the South, there is some light wintry precipitation stretching from Texas to Alabama. Although accumulations will be extremely light, there may be dangerous ice conditions. A cold week is forecast for much of the Midwest, Great Lakes and Northeast with temperatures staying below average. New York City has not been above freezing since Christmas Day. New Year’s Eve will be the sixth straight day below freezing. With temperatures not forecast to rise above freezing this week, the current cold stretch has potential to rank within the top 5 for most consecutive days with temperatures below freezing in New York City. The record is 16 straight in January-February 1961, but 11 straight would earn a spot in the top 5, according to the National Weather Service. 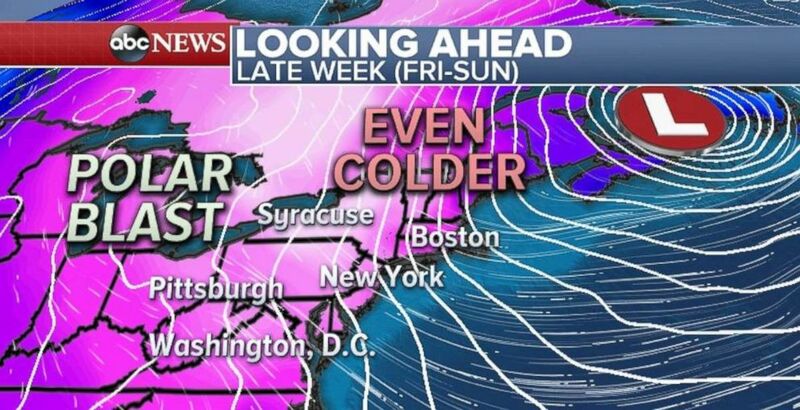 Forecast models are somewhat in agreement that another shot of very cold air will arrive in the Northeast by the end of the week into next weekend. This cold shot has the potential to be even more intense than the one the region is currently seeing. (ABC News) It appears likely right now that another deep freeze is likely to enter the Northeast at the end of the coming week. 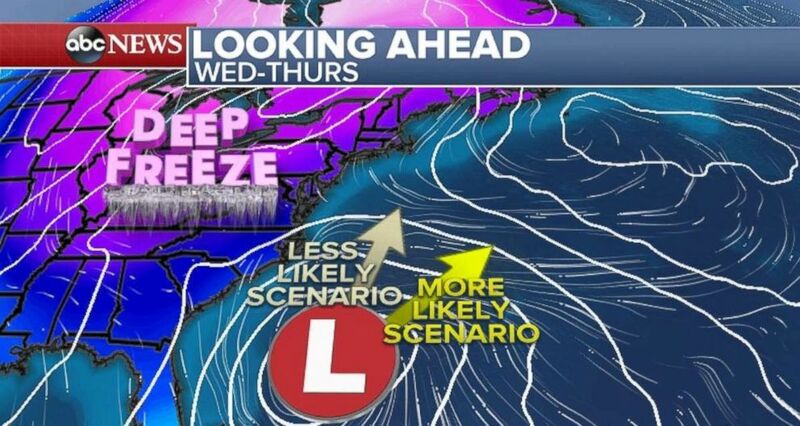 Part of this cold shot will be due to a strong storm system moving into the Atlantic Ocean later this week. At this point it is too early to determine the ultimate track of this system, however, the most likely scenario is that the storm will move out to sea without precipitation impacting the northeast U.S. However, the most likely scenario involves brutally cold air moving in directly behind the system. (ABC News) The air coming in at the end of the week is likely to be even colder than this past week's bitter temperatures.